Peter Custer at PrivatSea gets in touch to say that the motor yacht Turama is available for charter from 10 August 2011 onwards in the South of France. Turama has accommodation for 54 guests in 27 VIP Suites and 16 single cabins for charterer's staff, security and entertainers. 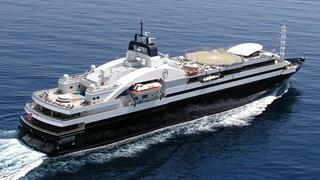 Peter says that, at 117m, she’s the largest yacht currently available for charter. Please check with Peter for rates and bookings.